An aerial view of the factory with Park Lane in the foreground. These photographs are from a collection I was given by the Guy works photographer, at the time Guy's finally closed. They would have been taken for publicity purposes or record purposes, and seem to date from the late 1940s or early 1950s. The Heavy Track. At this time it would only have taken buses, as no heavy lorries were being made. Later it would have taken 'Invincibles', 'Warriors' and, eventually, 'Big Js' and Leylands. 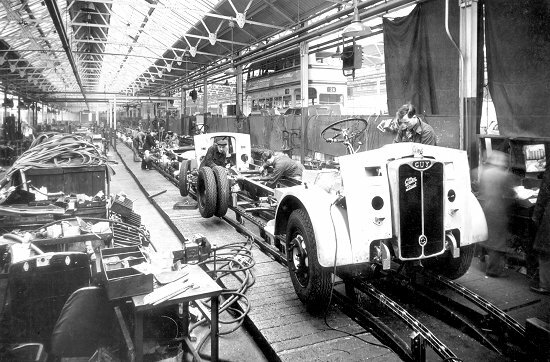 Guy was the first heavy vehicle manufacturer in the country to install a 'track', which was a kind of conveyor belt moving the vehicles along the production line. The end of the Light Track, which took 'Otters', 'Vixens' and 'Wolfs'. Here is an 'Otter' diesel at the last stage, which included fitting tyres, controls and radiators. In the background is one of the 100 'Arab' buses supplied to Birmingham Corporation, probably back in the works for adjustments after running in. 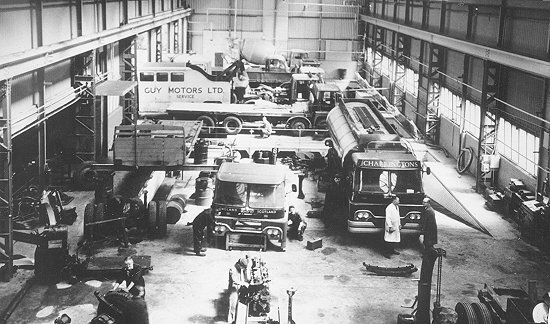 The Service Department section which undertook the overhaul and repair of components. 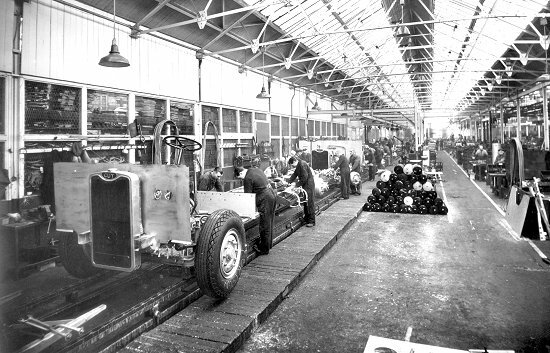 Across the bottom of the photo is the start of the Light Track, on which lighter vehicles were assembled. To the right is a 'Vixen' chassis about to go on to the track, where the first thing to be fitted is the engine. On the centre left the Heavy Track started, and there is a bus chassis about to go on to it. 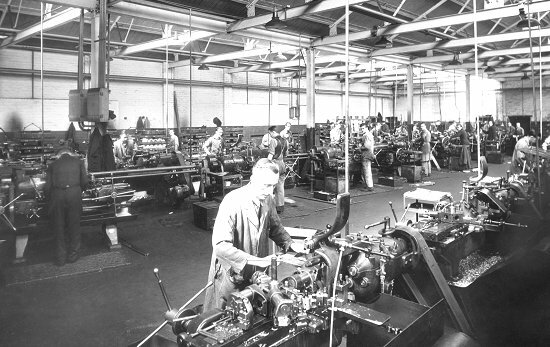 The whole area at the back of the photo is the Assembly Area. The Drawing Office. This room was originally the canteen. 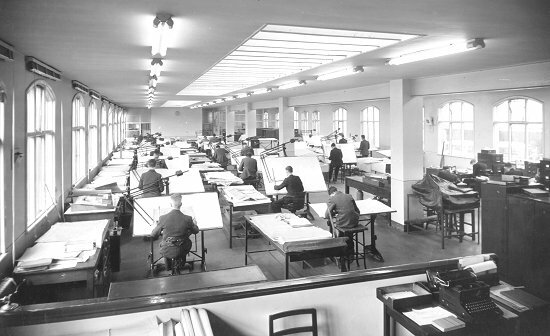 The Drawing Office moved there when a new canteen was built on the Sports Ground. The Parts Store with the main roadway leading into the Machine Shop. 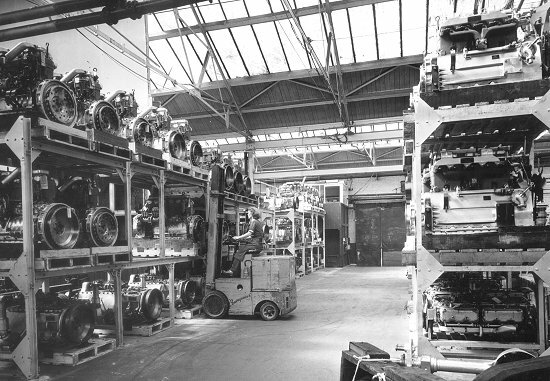 On the floor are Gardner HLW engines, and in the racks are GLWs. 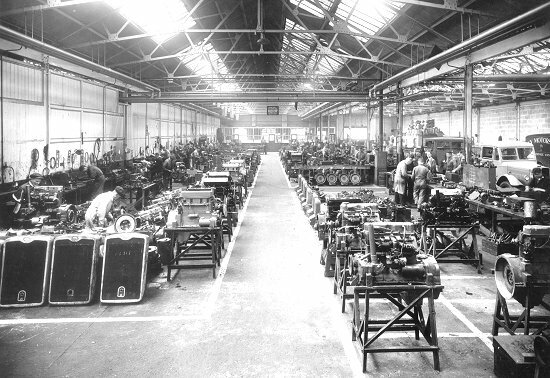 The stocks may seem large but at that time engines were hard to come by, and you bought as many as you could, when you could. 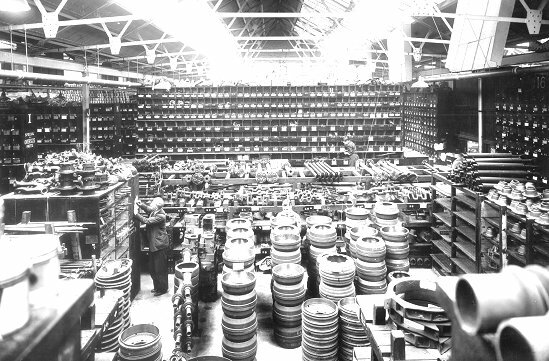 The Spare Parts Stores. Guy always seemed to carry a very large stock of spares. 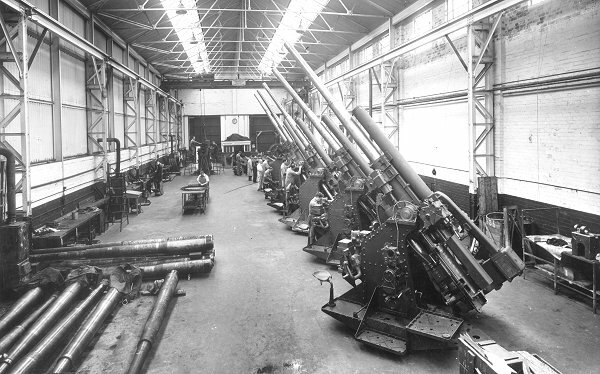 Anti-aircraft guns in 'The Hangar', the part of the works originally built for building bodywork for double decker buses. The guns were being refurbished and adapted for radar guidance under a contract with the Ministry of Defence. This sort of contract probably followed on from war time work for the Ministry on such items as armoured cars. 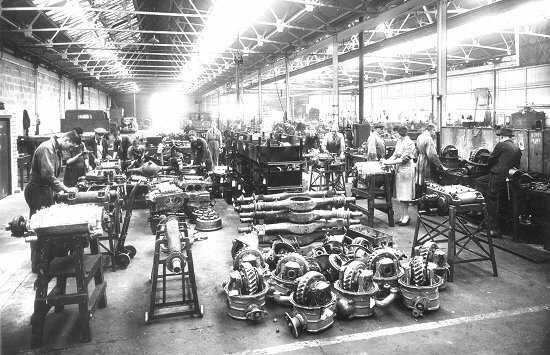 The Service Department section which undertook engine reconditioning. 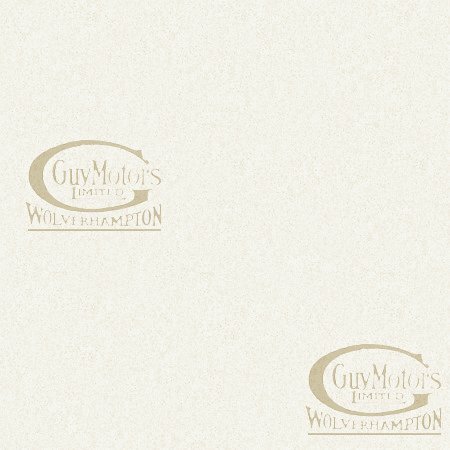 The engines are Guy and Meadows petrol engines. The Engine Test House. These are petrol engines being run in, tested and tuned. Gear cutting machines, middle floor. Top floor. 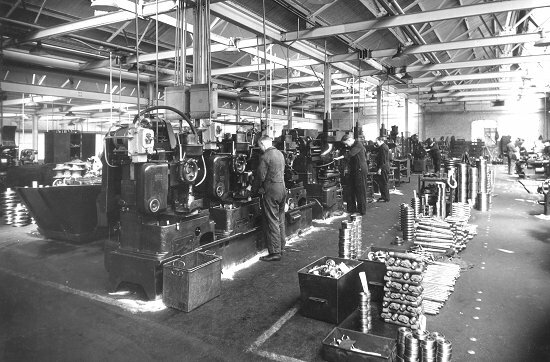 On the right are large plain cylindrical grinding machines doing a chucking job. 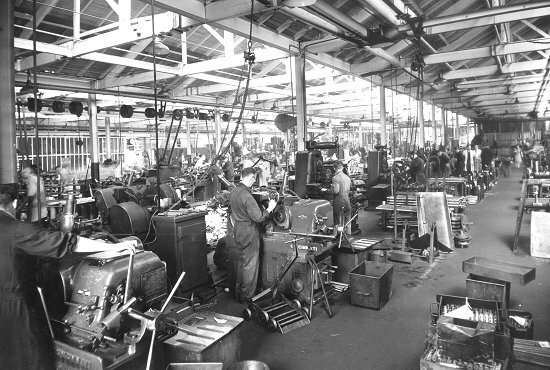 In the bottom right hand corner is a balancing stand for the grinding machines. Cincinnati machines on the left. 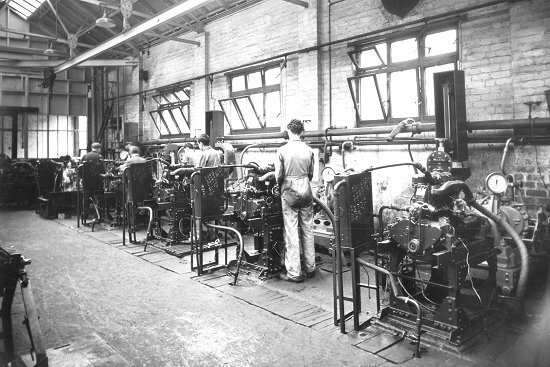 The Machine Shop, top floor. On the left, note the overhead drive shaft, but there is only one belt in place. 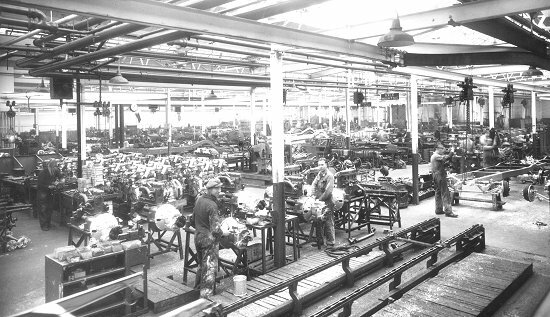 By this time belt drives were rapidly going out of use in most factories. 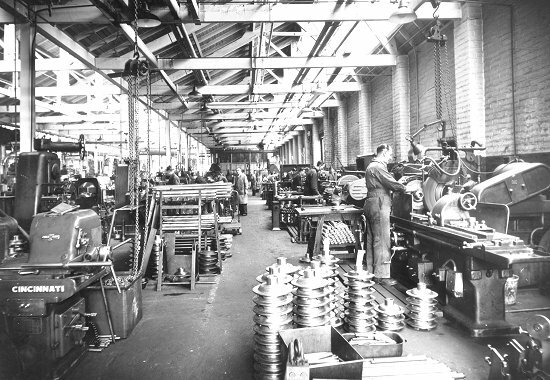 The Machine Shop. In the background are Herbert continuous feed machines. 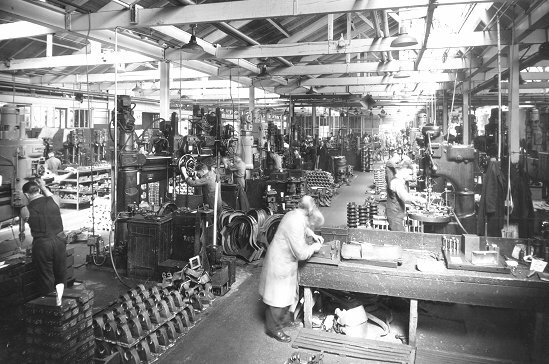 The Sunbeam Machine Shop which contained all the machines which were brought over from Blakenhall when the Sunbeam works were closed. The radial driller section, top floor. In the centre are pillar drills with swinging arms. On the far left are light drillers. In the foreground two inspectors are checking a component. This is the same section on a different occasion. 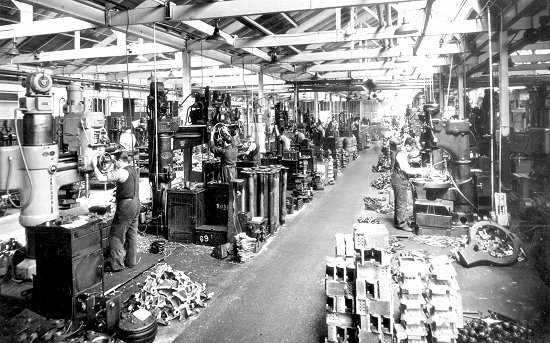 Machine shop (top floor), light drillers section. In the raised area behind the machines are the foremen's offices, the work's barber shop, and a ladies' rest room. 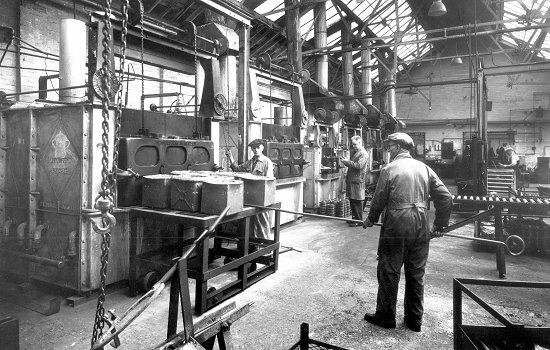 Hardening Shop, heat treatment furnaces. The foreman in the middle of the photo is George Dyson. He was noted as an avid fan of Hank Jansen's western novels, copies of which he always had around the works. 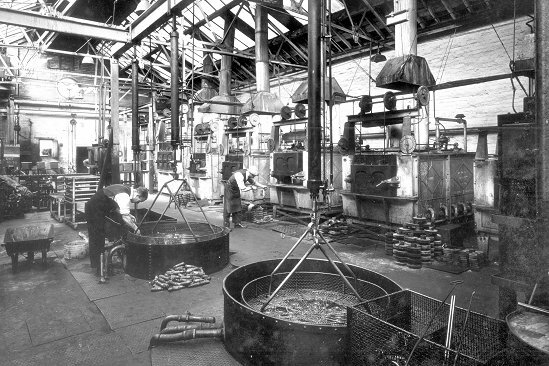 Another view of the Hardening Shop. 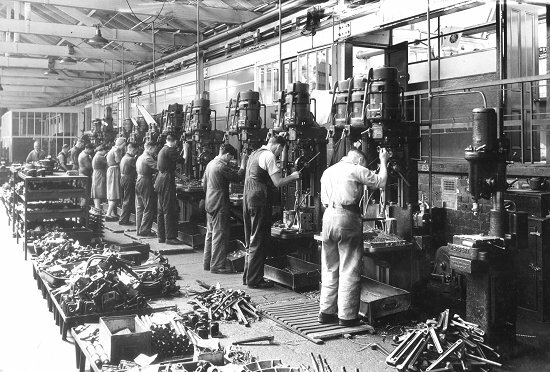 Hardening was done by a variety of methods, including oil hardening and cyanide hardening. 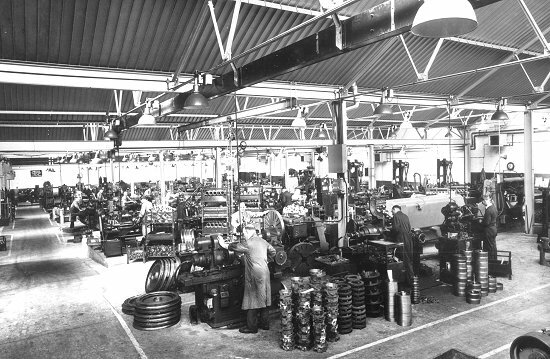 A final view of the factory.